Anyone who reads my blog would have come across recipes like Goalondo Murgi or Railway Mutton Curry and by now know who Pritha Sen is. 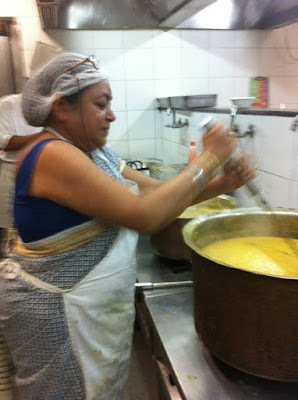 And if you don't read my blog but you are a Bengali food enthusiast, there is not an iota of doubt that you would know her! 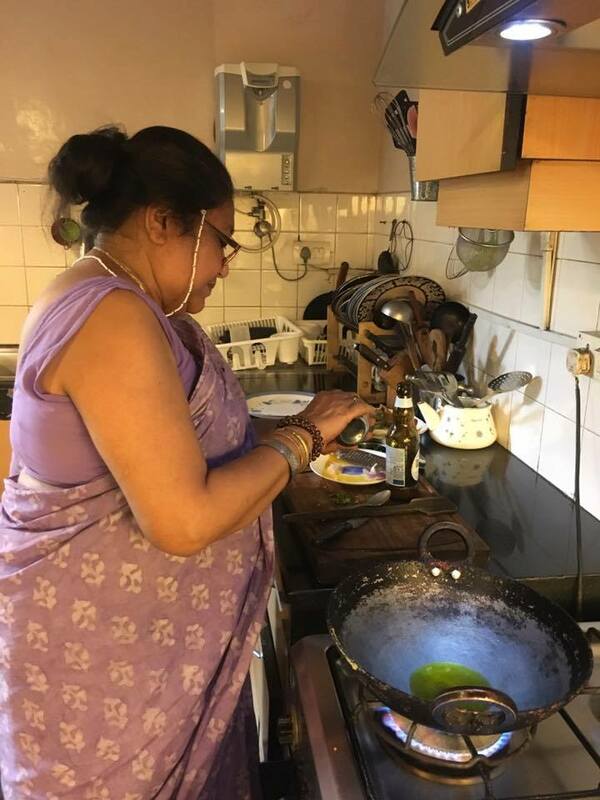 For the uninitiated, she is a journalist, a food consultant, a development consultant and last but not the least -- the person who unearths lost recipes, ingredients, cuisine from undivided Bengal and traces their history. The reason I respect PrithaDi so much is not only because of her repertoire of knowledge on food but because she is one of those rare breed of food writers who are also very generous with that knowledge and experience. She is always there to share her recipes, suggesting changes, answering questions, guiding you along the way. I have learned a lot from her and hope to continue that in the future. 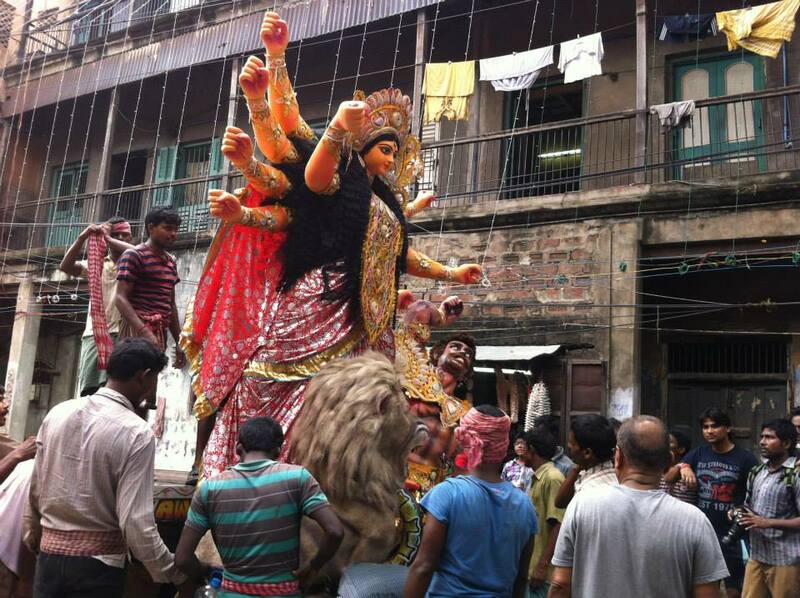 This Durga Pujo, I bring to you Pritha Sen, woman power in food from Undivided Bengal (as she puts it)! My humble ode to thank her for all she does. Come join me as she talks about everything food -- from her foray into food history to the Bhog she cooks at her community Pujo, from her childhood pujos to her special pujo memories. how—and where—you grew up and how food influenced your childhood? married, traditional cuisine was very much a part of the daily fare and some unique recipes. tinda or a jimmikand or shalgam. confectioner’s and deli in Kassel in Germany and was a terrific baker as well. Tamilian, Maharashtrian, Anglo-Indian et al brought together through Railway service. calling me ‘Bangaal’. 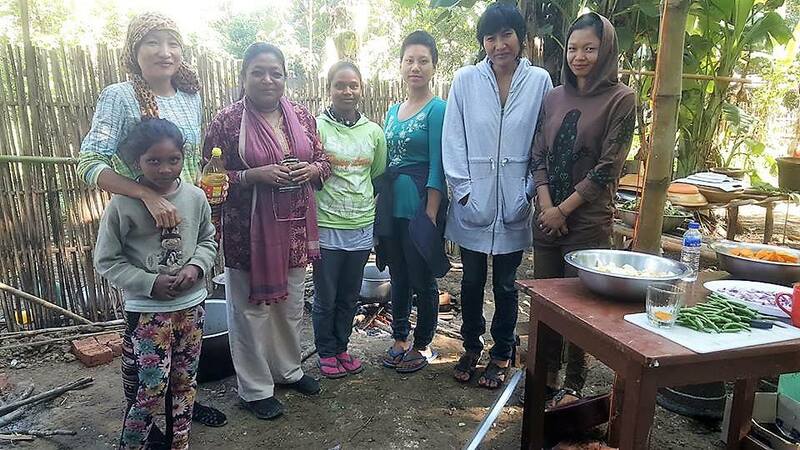 I went to their homes and found they ate differently." had none to share. That was when I began to feel the need for roots. habits but dialect too, the same holding true for ‘Ghotis’ or those belonging to West Bengal. 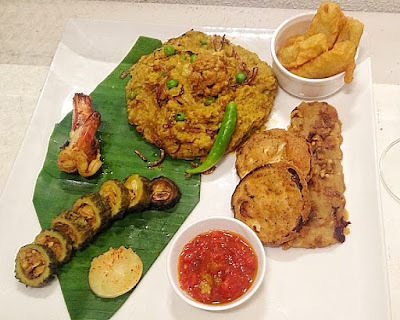 "A Bengali is much more than the sum of the state of West Bengal, best demonstrated by its mind-boggling repertoire in food that once changed from village to village." roots in Gaonpara village of Dhaka-Bikrampur. part of the traditional styles of eating still remained in pockets. It further fueled my interest. fish curry, poppy seed and mustard paste. take shape? Was it seeing your parents cook or someone else? were not really allowed in the kitchen. sense of taste from a very early age. "My passion is to understand why we eat what we do, how we eat and to deconstruct the story of our food.Presenting to the world the best is not my aim. It’s presenting the real and making people aware of the indigenous wisdom that makes up our food is my core interest. " Also here I would like to correct you. My passion is not for cooking. I am a very lazy person. My passion is to understand why we eat what we do, how we eat and to deconstruct the story of our food. rejected mulo or radish and most nowadays turn up their noses at it, have been completely bowled over and finished entire meals with a single dish of mulo that I have cooked drawing upon the techniques and styles that are fast being forgotten. In short, my mission is to generate interest in our very own traditional culture of eating and not being apologetic about it. 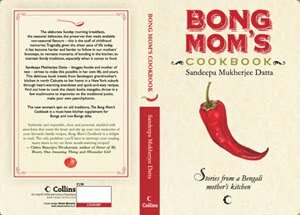 When I first started posting in food groups, generally food that was cooked daily at home, for instance a chhyanchra and explaining the Bengali ethos of using all parts of edible plants or fish and hence the wisdom of nutrition, I would get hate mail in my inbox asking why I was doing this and that people would laugh at us Bengalis. This made me more adamant, because I did not think we had to be apologetic about our food. Today it makes me happy to see Bengalis posting every detail of their food with pride and I like to think I had some part to play in this awareness and resurgence. My interest in cooking therefore was by default. Because I had to do it myself. Like I said, I was never much of a foodie and disliked eating out or ordering in. So whatever time I came home I would cook and invite whoever was there to join. My house soon became an open house. Everybody knew they could drop in any time and get a meal. Because thanks to my mother I had learnt how to make do with anything at hand as long as I took care to make it tasty. And thanks to my mother too I could not eat the same thing every day nor could I have badly cooked food! That’s how I started cooking. My interest in food history was there dormant right from childhood. Like I said I grew up in rather cosmopolitan environments where each person ate differently. Then I have lived in the east, the south and the north. It began to blossom and grow when I started my work in social development and sustainable livelihoods. I would travel to remote areas and stay with the people and eat their food. It was then that I began to realise the simplicity or the complexities of our regional food. "The use of coconut milk in Bengali cuisine today I realise is because it was used to mask the taste of brackish water spread out over Bengal’s estuarine geography. And you will find this true of all coastal areas right up to South-east Asia." areas right up to South-east Asia. I still remember how salty the water was in Calcutta till about 40 years ago. I could not drink it and would puke when we visited Calcutta. My mother would carry water for me in a couple of kunjos! When I zero in on a dish or ingredient I become slightly obsessed with it. I become insular, non-communicative with social engagements and totally focus on it. My academic qualifications in history and training as a journalist have helped me immensely. I speak to various people, I read a lot of books and do intense research and work backwards. Naturally the first people I talk to are my family – my mother and my aunts. There is one person I would like to mention here, who I refer to as my “other mother” – Mrs Jaya Chaliha, co-author of The Calcutta Cookbook and innumerable articles on Bengal and Calcutta. She was the person who nurtured my curiosity in food history. While she didn’t cook, her knowledge drew me and I used to help her with her research as a rookie writer, which has given me a sense of how to go about it. of the above which is the role you most enjoy? You missed out on my work in sustainable livelihoods. That is living history. "Bringing people back to the indigenous wisdom of our food which is real, alive and vibrant among the subaltern yet ignored by the urban elite is what I enjoy the most and that cannot be done unless the fascinating history of the food is traced"
the subaltern yet ignored by the urban elite is what I enjoy the most and that cannot be done unless the fascinating history of the food is traced. In these times of global fusions which may or may not be conducive to the Indian health or constitutional make-up, one has to generate interest and then awareness. Just posting a recipe with a nice picture does not do that. So finally you can say food history and the people eating it is what interests me the most. Durga Pujo as say when you are cooking at a pop-up? All that dressing up is also beyond me. Bhog! So I took it up as a social commitment and thanksgiving for all the good fortune that has come my way. I had never before cooked for 500-600 people. Yet I walked in supremely confident that first time and was suddenly infused with great energy. I just cannot explain it. "Yet I walked in supremely confident that first time and was suddenly infused with great energy. I just cannot explain it." 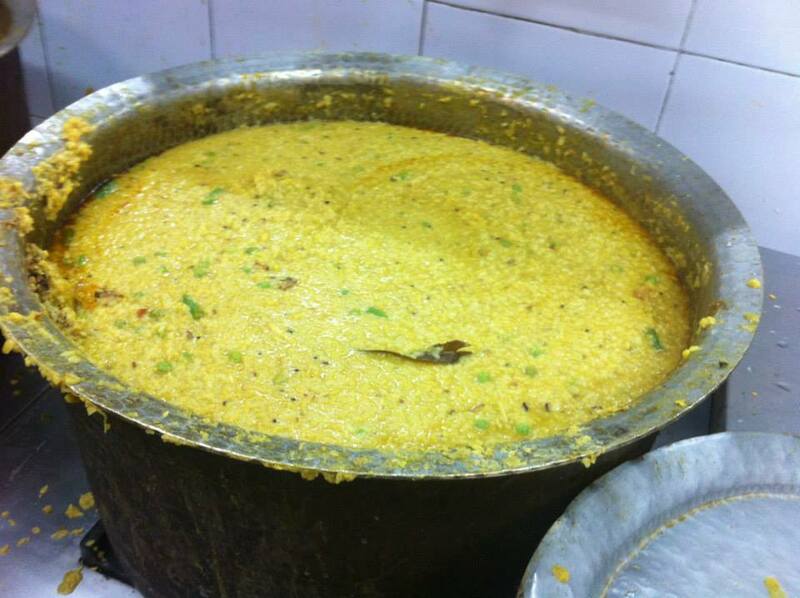 Believe me, it’s been 4 years now that I have been cooking the bhog. I start at 7.30, and I finish by about 12.30, on an average 7 dishes for the three days every day, each day it’s a different menu, albeit with helpers who do the chopping and masalas and frying etc and each time I have felt it wasn’t me doing it. It just wasn’t me. My measures for such large scale cooking suddenly flash upon me visually. If you ask me about weightage and grammage of masalas I cannot tell you. That’s because when I start the cooking I can suddenly see how much I have to put. I don’t know where the energy comes from. So it is very different from cooking for a pop-up where I am never confident and always nervous about how it will turn out and it stresses me out. cinammon and slices of ginger. Add the salt in the water you use for boiling. You may add some green peas and potatoes towards the end of boiling. Then in a separate karhai, heat ghee and temper with whole jeera and bay leaf. Add jeera powder, whole dry chillies, haldi and chilli powder and ginger paste. Sometimes I add some hing. Fry this masala well add to the boiled rice and dal. You may add some green peas and potatoes. Mix well and let all spices blend in well. A dash of sugar is optional. brown in good old Jharna ghee! Keep covered for the flavours to infuse. Any specific childhood pujo memories that you yearn for this time of the year? tide, preferring though to do my own thing in isolation. But one memory keeps coming back. In the small town that we lived in, Vijayadashami celebrations at our house were legendary. It was celebrated over two days, with about a 100 people each day. The first day the workers and their families from the Railway workshop and other staff were invited. The second day it was the officers. It was a huge festive activity in our house. My mother requisitioned huge vessels from the Club and unoons were made in the backyard where she did all the cooking herself. You could, in today’s lingo, call it my mother’s annual pop-up. We kids would be running around excitedly, helping with small things, eating more actually and would invite our friends to come and spend the day. The menu was fixed. Every day Ma would make a minimum 200-300 of her linen soft, translucent and grease free special dalpuris sitting at a tola unoon. Then there would be alu dum, ghugni, nimkis, elo jhelo, narkel naru, pantua and Ma’s signature chhanar pulao – all single-handedly made by her. after pandal hopping but I discontinued it a few years ago. 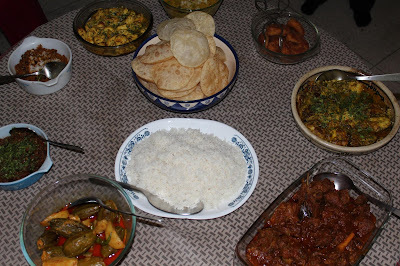 Any particular Durga Pujo food tradition that you would like to share ? I remember your FB post about a bhog of non-vegetarian dishes like fish for Ma Durga. Can you tell us a little more about it ? So with all the brazenness of a researcher, I walk in uninvited into the very private and low-profile, yet spectacular family puja of the Dasgupta family in upmarket South Calcutta. It is that time of the year when more than a 100 family members spread out all over the world congregate in the Dasgupta home for four uninterrupted days of the aradhana of Shakti. The family has detailed records of this annual tradition, first started in Khulna and then moved to Jessore, both now in Bangladesh and carried on uninterrupted for 485 years. In 1959, Benoy Bhushan Dasgupta, brought the puja to Calcutta from Bangladesh. There is no doubt about the fact that the Dasguptas follow the Shakta tradition of worship as soon as one sees the deity. Exuding intense energy, the passion blazing in her eyes, the idol is a very unusual colour and gorgeous in gold and silver jewellery handed down through the generations. "Followers of the Kalikapuran code of rituals, a striking departure from the usual ‘niramish’ bhog is the Matsya- Bhog or use of fish in every dish that is cooked for the Goddess"
I move steadily towards the kitchen where the bhog is being cooked and strike up a conversation with the ladies of the household. Followers of the Kalikapuran code of rituals, a striking departure from the usual ‘niramish’ bhog is the Matsya- Bhog or use of fish in every dish that is cooked for the Goddess. Five hundred year old menus and recipes have been neatly recorded and still followed to the T. So through the four days different dals, with the kalai dal holding a very special place, are cooked with fish head and bones. 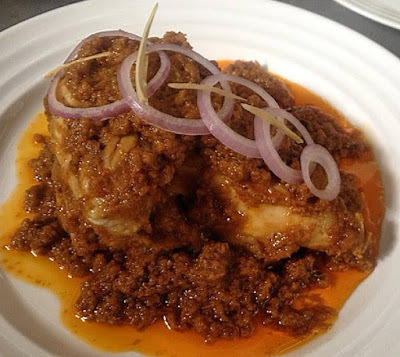 An interesting dish is the Jholer Byannon, an unusual combination of pumpkin, banana stem, ash gourd, unripe bananas and unripe papaya, cooked with fish head and every other part of the fish that does not go into a curry, along with shrimps. "Two or three kinds of fish are usually cooked as main courses. On Navami day, a platter comprising fried hilsa, fried koi (climbing perch) and fried prawns is offered to the Goddess, to be had with Panta bhat or fermented rice. In all the days, kochu saag or colocassia greens are important because it represents the Goddess Kalika." Wading through various accounts and recent documentation, I find that the Mukherjee family in Behala, Calcutta, famous for their Sonar (gold) Durga, has similar bhog rituals. Apart from the usual fried fish and fish curries and chutneys made from the season’s first gourds and colocassia greens, one signature dish offered is Shol Maachh Pora or the Snakehead Murrel, roasted on coal and wood fires with masala and oil. "In Nuliya tradition of Bishnupur, the seat of the famous Malla kings, the fisherfolk offer locally caught fish like Chang maach or Taki maach in a pot of curds to the deity"
Such departures from the usual Vaishnav cuisine offered today as bhog makes me think of a primitive past, when Brahminical directives had not been cast in stone and rituals were a shared heritage from our ancient pagan and pantheistic roots steeped in the worship of Mother Earth. Vestiges of this remains in the Nuliya tradition of Bishnupur, the seat of the famous Malla kings, where the fisherfolk offer a Chang maach or Taki maach in a pot of curds to the deity. Having traversed such an interesting terrain of Durga puja food rituals, I return to my meat bhog at the Dasguptas. Served with luchi for dinner, the meat is but naturally cooked sans onion or garlic and termed ‘Niramish’ mangsho. Quite an oxymoron, onion and garlic are still considered more non-vegetarian than fish or meat and have no place in the bhog kitchen. While there are numerous ways of cooking this special meat curry, the most common ingredients being garam masalas, cumin, coriander, ginger, coconut, turmeric and chilli, a couple of other recipes make me wonder about influences from upper caste settlers in Bengal in direct contrast to the indigenous ethnic traditions. Other than Bhog, what is your favorite thing to eat during Durga Pujo and where? I love the deep-fried chops and cutlets! Where can I find her blog or cook book because I couldn't find her blog. what a wonderful wonderful read. Thankyou so much for putting this up, reading this was a priviledge! Loved reading this! Though I wish PrithaDi did have a blog or cookbook! She does have a column on the Indian Express...and its delightful. It was a wonderful piece...so well written, felt as if talking to Pritha di sitting right in front of her.. I felt like being part of her entourage after reading this..
Mutton Curry in honour of Pritha di. My husband thinks it's even better than biye baarir maansho!